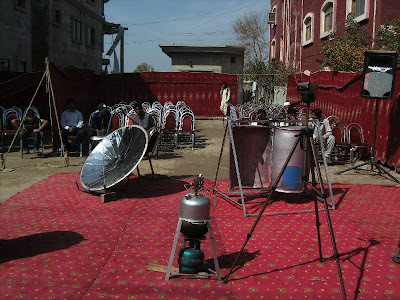 The idea for the establishment of the IAM originated out of inquiries from students of local universities, who received information on various occasions at the CAT (NGO) about Appropriate Technology. Objects mentioned in the literature can be seen at CAT and their working is explained. Apart from NGOs, companies and private persons, there are CAT clubs in 7 Sub-Divisions and a Youngster-Club since 2009. Future students learn here in a playful manner among others handling devices, which are friendly to the nature. The basic concept of IAM was initiated due the excellent relationship with BUST. Of course one finds reference to Appropriate Technology in the brochures of universities, these are however understood as an extension of the regular study programs. But Appropriate Technology is lot more ! It is a complete way of thinking and therefore to be placed equally along with disciplines like economy, trade, society and politics etc. 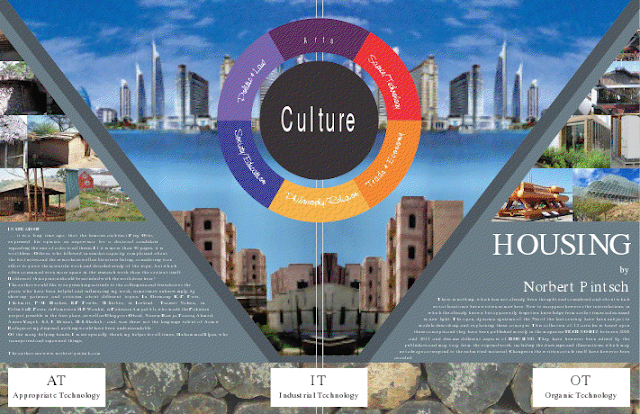 It is important here to differentiate between the rather holistic approach with elements from traditional culture, like visible in rural life, and the rather open resource depleting system, a it can be seen in urban and semi-urban regions and the closed independent system. The holistic system is however not to be understood as an escape into the past, but on the contrary, it carries forward the futuristic approach by building upon the existing open system. One can understand it well from the following example: the low-tech method of faeces-disposal on one side and the high tech recycling method as used in the europeon space lab. We can see, AT is more than only a technical aid. 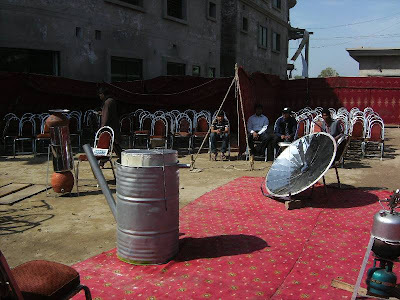 In the face of energy shortage, particularly in the rural areas of Pakistan, Appropriate Technology is the obvious solution and people are turning to appropriate technology solutions. Best thing is that appropriate technology solutions are not only affordable and available but they are guaranteed anywhere. 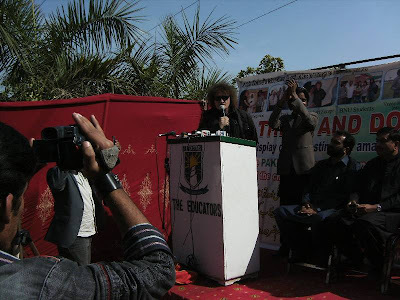 Dr. Norbert Pintsch, an appropriate technology expert, was chief guest at appropriate technology exhibition in Superior College, Dipalpur (district Okara) on March 13, 2012. Mr Shakeel -teacher in the college and a member of Technical Transfer and Training Center from men AFA (NGO) in village TGD – had arranged an awareness exhibition. Dr. Norbert Pintsch also gave a presentation to the students and other notables of the area. Among others, PTI member and MNA Mr Arshad, Mr Rashid and Mr Wariam, Mr Farooq and Mr Ilyas from the AFA-NGO also attended the function that was followed by interactive questions answers session. 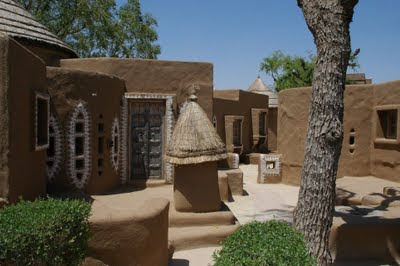 Hotel Mandawa (India) Desert Resort with mud covered cottages. The term Housing was discussed in some of our recent articles and we referred there to the Cultural Model, in which the human effort is actively promoted, -the traditional one as well as the socalled traditional one. The Inter-dependencies between the individual areas can be epoch-making, for example currently the economy. Is an individual area so important, it can be compared with a cold star in the astronomical terminology. In our example this would mean that the economy does continue to play its role but not in its current ly known form. The history of science amply proves that followers of a certain surviving form or method cannot be easily convinced through arguments. As the Nobel-prize winning scientist Max-Planck once said, the next generations will be "normally" working with things that today appear to be cimpossible or non-sensical. This should mean that it takes only one generation to make unthinkable quite normal. The technology is extremely dependent upon the economy and therefore economic considerations appear always to play a role, which however is only short-term and short-sighted and actually based upon a postponement of the problems and actually assumes the problems of Resource-wastage, environmental pollution and destruction of cultural values, which however also requires the ability to recognize these losses. One cannot and does not want to recognize something which one cannot see! A holistic way of looking at things is the necessity here. A view of the situation in totality, which is hardly possible in the current era of times pressures, which prevent reflection on the real causes and contemplative view of things. Read the article in print in Techno Biz Nov 2009 issue! Have a look at southern methodist mustangs tickets, southern miss golden eagles tickets and st bonaventure bonnies tickets and buy. This superb documentary by Caterina Borelli is a study of the craftsmanship involved in the construction of the mud brick architecture of the Hadramaut and Do'an valleys of the Yemen, and the cultural aspects of a traditional architecture which incorporates an understanding of buildings which dates back centuries. Expanding the existing knowledge of these earthen heritage properties, examining their behaviour in the local climate and the preservation of traditional craftsmanship as part of a sustainable conservation future are the other prominent concerns of this work. Read the review of the documentary here ! We are living in the world of telecommuting and extended networks. This has given many benefits but has also made monitoring difficult. Human resource management is one of the complex functions of any organization already. Now it is even more difficult when people are working at different places. At the same time HR functions are directly related to the productivity of the organization. That is why organizations need to track activities of the employees. What they do on computers and how they use them? Thanks to Employee Monitoring Software that it does just that – allows you to control remote employees from anywhere. The feature packed Employee Monitoring Software is ideal for tracking activities, use of applications on computers and productivity monitoring and more. Have a look and see what My Team Monitor can do for your organization, large or small. Better still download the software and give it a whirl. It is free for now. And it is utterly easy to use: sign up as a boss, add your employees, employees download software and you monitor then from web interface. And it is available for Windows as well as Mac. No download for the boss while you keep a virtual eye on what your staff is doing and how. Given my own interest and experience, I can say that monitoring is essential. Employee Monitoring Software will make it easier to know what your employees are doing and how your IT resources are being used across the network? You will not only be able to control remote employees from anywhere but this will sure increase your remote employees productivity by monitoring their work efficiently. In the world of telecommuting and extended networking, this seems to be a must for every savvy boss. Have a look and take advantage of free offer. This may be one of the best business decisions you make. Pursue programs aimed at improvement and education of Art among children, women and youth. Actively cooperate with agencies organizations working to the development of Art and culture internationally. 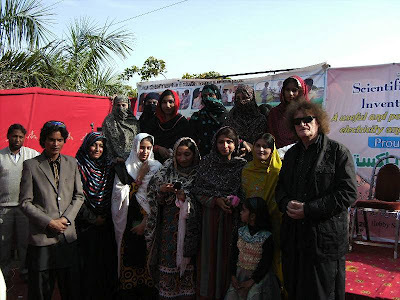 Undertaking programs for the introduction and welfare of artists associated with different branches of art from Pakistan as well as of foreign countries. Establishment of a film club to encourage and appreciate valuable art films made within the country and abroad. Production of documentaries on various subjects relating to art and culture. Participate in the international campaigns for different venture of human welfare. Foster and develop contacts with the organizations engaged in the improvement of art and culture in Pakistan and abroad. Perform all such acts, matters and things, as are incidental or conductive to the attainment of all or any of the above mentioned objectives which may have direct or indirect bearing.